Collecting Great Britain stamps is very popular worldwide. Being the first stamp-issuing country, Britain also provides us with a multitude of different historical ephemeral items, some of them being even more interesting and occasionally more valuable as the stamps and covers themselves. What exactly is the philatelic definition of "ephemera"? Philatelic ephemera refers to paper documents that compliment a stamp collection or stamp exhibit. These documents can be posters, poster stamps, philatelic labels (Cinderellas), historical documents, picture postcards, admission tickets, etc., which can be used to enhance and beautify a stamp collection. If the philatelist doesn't mind having a few "lumpy" album pages, these ephemera items can even include contemporary coins, currency, medals, etc. A gold Sovereign of each of the British monarchs would make a GREAT addition to a philatelic display! These ephemeral items, when used to illuminate famous people of the era in which stamps were issued, can even be royal decrees! For the philatelist specializing in 19th Century Great Britain stamps and postal history, the epitome of historical ephemera would be to have a royal document with the signature of Queen Victoria. 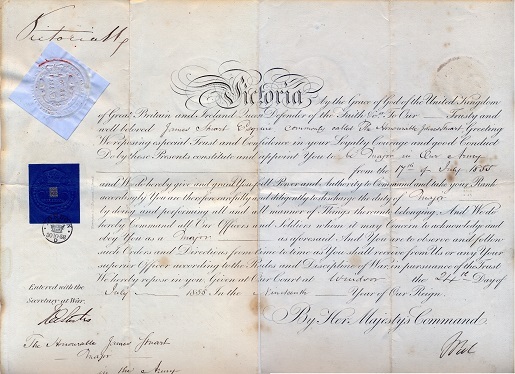 The much-reduced image below is a royal military commission, issued in the name of Queen Victoria and dated 14 July 1855. The actual size of the document is 14 inches x 11 inches. Victoria by the Grace of God of the United Kingdom of Great Britain and Ireland Queen Defender of the Faith. To Our Trusty and well beloved James Stuart Esquire commonly called The Honourable James Stuart, Greeting. We reposing Special Trust and Confidence in your Loyalty, Courage, and good Conduct, Do by these presents constitute and appoint You to be Major in Our Army from the 17th of July 1855, and We do hereby give and grant You full Power and Authority to Command and take your rank accordingly. You are therefore carefully and diligently to discharge the duty of Major by doing and performing all and all manner of Things Thereunto belonging. And We do hereby Command all Our Officers and Soldiers whom it may Concern to acknowledge and obey You as a Major as aforesaid. And You are to observe and follow such Orders and Directions from time to time as You shall receive from Us or any Your superior Officer according to the Rules and Discipline of War in pursuance of the Trust We hereby repose in you. Given at Our Court at Windsor the 24th Day of July 1855. In the Nineteenth Year of Our Reign. By Her Majesty's Command. At the upper left is the signature of Queen Victoria. 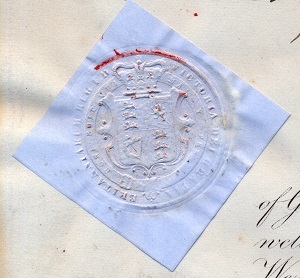 Below that is the Royal Seal of Queen Victoria. Below that is a 1 Pound 10 Shilling embossed revenue stamp, which is affixed to the document. At the bottom left is an authorized signature from the office of the Secretary of War. Below that is a script notation stating "The Honourable James Stuart - Major in the Army". At the bottom right is the signature of the Prime Minister.